A Pittsburgh official who was arrested after an altercation at a Detroit hotel has been arraigned on the charges. 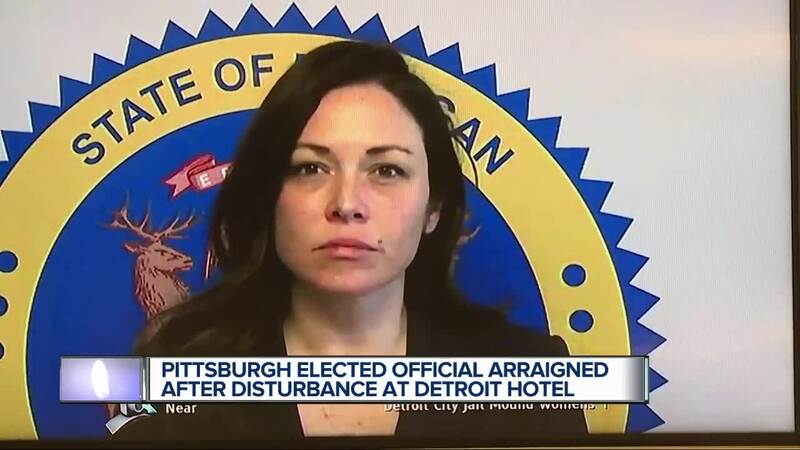 DETROIT (WXYZ) — She is an elected official from the Pittsburgh area who came to Detroit for vacation with her husband— and found herself locked in jail. Today - a judge arraigned her on serious charges. Her attorney says the charges are suspicious. Chelsa Wagner and her husband Khari Mosley came to Detroit for what they called it a late Valentine’s Day present. What happened during their stay led to them to facing charges. They both waived their right to hear the charges in court. Allegheny County Controller Wagner is charged with two counts of Restricting and Obstructing Police, a felony carrying a maximum penalty of two years — and misdemeanor disorderly conduct charges. Mosely is charged with two misdemeanor counts of disorderly conduct and disturbing the peace. Wagner recorded video on her cell phone during their stay at the Westin Book Cadillac Hotel. Her attorney says she went to bed while her husband stayed up. When he realized he didn’t have a room key, the hotel staff couldn’t help him because the room was in his wife’s name. Detroit Police say he was belligerent when they responded. After they helped him back to the room - there was yelling - so police returned and cuffed him. The prosecutor says Wagner grabbed the officer’s arm as he left. His attorney today said the timing of the charges connected to the March 6th incident are suspicious. They came one day after he sent notice they plan to sue police. The judge gave the couple a personal bond and no restrictions so they can return to their homes in the Pittsburgh area.